You see that story below this one? I’m referring to the one about how Bremerton is going to forgive you your parking ticket if you received it between Dec. 18 and Dec. 26. Bremerton City Councilman Adam Brockus would like you to skip right over this entry and go to that one. For one, he was largely responsible for getting the momentum to get those tickets forgiven. The former council president and the still-going mayor said as much Wednesday. So if you got one of those citations, Brockus launched an effort that saved you some money. Secondly, though, the council elected a new president and vice-president Wednesday night. It was done with little drama, befitting a council that generally appears to get along. 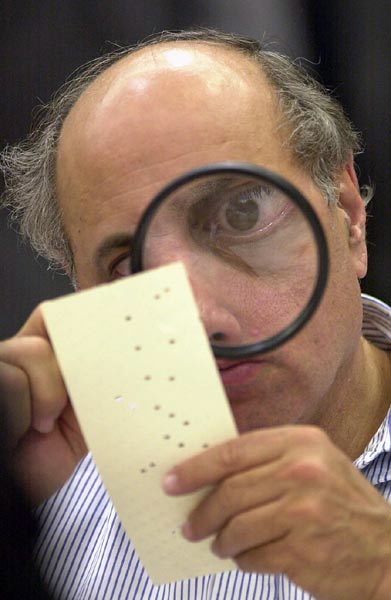 There was one close vote, however, for the vice-president’s position, an election that gave Brockus a moment Floridians who used butterfly ballots in 2000 would have loved. Cecil McConnell, who was council president two years ago, was elected 7-2 as president again, beating out Brad Gehring. The vice-presidential contest was between Roy Runyon, nominated by Dianne Robinson and Nick Wofford, who was nominated by Brockus. Carol Etgen, city clerk, read the names from the vote and said Runyon had won 5-4. As is custom, she read the votes from the individual council members. Brockus asked if he could “correct” his vote, a question that required the legal study of Ken Bagwell, assistant city attorney. Bagwell read, then told the council it would be up to them to decide whether Brockus could make the correction. The council voted 7-2 that he could. Runyon voted to allow him to change the vote, helping ensure his own defeat. Etgen found another form for Brockus to vote on. He went over and, based on what we heard at the meeting, cast his vote for Wofford. Congratulations, Roy Runyon, for your generous support in doing what was obviously the right thing to do. No one nominating one person for a job would actually vote for another unless Councilman Brockus was focused on a next day hot job interview and zigged when he should have zagged. The human condition.